Readers will see winking, blinking, hiding, staring, and even bulging eyes pop out in vivid color as they turn the pages of this book. The exquisite photography explores animal eyes—from the elliptical eyes of cats and other nocturnal animals to the facets found in the eyes of flies. Interwoven into the tale of the eyes are exemplars of each eye type. The elephant’s small eyes with three eyelids and long lashes contrast starkly with the colossal squid’s frisbee-sized eyes! Unique eye features will expand readers' vocabularies. For instance, they will discover that the tapetum, a mirror-like tissue at the back of a cat’s eye, reflects light and makes the eyes appear to glow. The pits, located between a pit vipers's eyes, enable it to sense a change in temperature. Birds, alligators, sharks, and amphibians have a third eyelid that is a clear membrane, called a nictitating membrane. 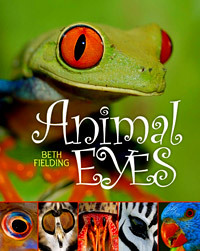 Readers will also learn that eye color varies throughout the animal kingdom. Frog eyes may be gold, red, or green, and lemurs’ eyes are blue. Variations in eye size are quite dramatic. The compound eyes on the eyestalks of a crab are very different from the 5-centimeter ostrich eyes, which appear to cover its entire head! Guess who? After thoroughly digesting this mesmerizing text, the reader finds a dozen eyes to identify. The moth eyespots are sure to trip up a few who attempt this challenge! In addition to a glossary and an index, the text has a concluding summary of how our eyes work—a description that is sure to lead the reader back to the beginning to compare and contrast the animal eyes once again.